Overall Score: 53 / 80 66% D “Average Game for Girls” – NOTE: If we ignore lack of story and not a strong variety in characters, the score would be 53/60 or 88% B+ “Very Good Game for Girls” which more accurately reflects my own enjoyment of this game. Overview 10/10: This is one of the most addictive and fun and quick little IOS games in my library right now. 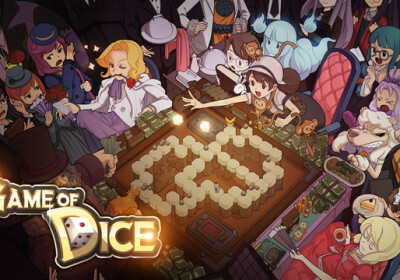 A Game of Dice is a fast paced online boardgame available for IOS and Android. Not only is the game free, but it also hosts tournaments in which you can win $100 usd if you are able to get 10 consecutive wins in a row at the master level. It’s a game played with other people from all over the world and, from what I’ve seen, there’s never any waiting for a game match while searching for players, so it’s very active, and full of people waiting to play with you. Gameplay: 10/10 The premise of the game is very similar to boardgames such as Monopoly. You roll dice and move around the board collecting properties; as you pass the start line, your properties level up and the rent charged to players who land on them increases. If you roll 3 doubles in a row, you go to jail, where you can either pay, or roll a double to get out. The board itself is very small, and it is a bit disapointing that the board is always the same regardless of if you’re in a rookie match or a master tournament. I think it could do with some more levels with more advanced boards. But one of the pluses of having a small board is that the game moves incredibly fast. READ New LEAKED Trailers for Persona 5! NEW RARE Never Before Seen! New Footage. UPDATE. The twist of this game comes in the form of very shrewd competitive gameplay. Initially when you begin, if a property is unowned, it’s yours, free and clear. The twist is that should another player land on your property, after paying your rent, they have an opportunity to take over your city, if they have what’s called a take over certificate. Now these certificates can be bought for cash (real money), or earned through gameplay. You might think it is unfair or game breaking – but the game does have some mechanics in place for damage control. They limit the number of certificates a player can have at any given time to 3 certificates. Who goes first is chosen at random, and if you get stuck going last, you’ll be given a free take over certificate to help you catch back up. There are squares in the game where you can get additional certificates for free if you land there, or squares which allow you to teleport to and claim an unowned city as well. The other twist to this game is that it is also a card game. You can take with you 9 cards, which you can customize. Some take money from your opponents, some let you roll more dice, or guarantee a double, others even allow you to claim more cities. You can summon new skill cards using gems – a special currency, which you can either earn while playing or buy for real money. In addition to your skill cards, you also draw cards for different stat-enhancing dice sets and characters. You can also upgrade, enhance, and combine skill, dice, or character cards to further increase the bonuses from them. Gold is the currency used to perform these enhancements and is sorta the “Default” or “free” game currency. Similar to Monopoly, the object of each match is to be the last man standing by making your opponents go bankrupt. Lastly, there’s another currency called “Joy” which allows you to enter higher level tournaments, purchase “gems”, or “Invest” in your properties during a tournament (which will greatly magnify the cost of rent should an opponent land on your squares). You win Joy by winning a tournament or sometimes through random events and cards. Higher level tournaments award you with more Joy for your victory. Graphics: 8/10 – Cute and colorful anime graphics, with high quality artwork on the cards and fully animated “retro” “chibi” styled sprites while in game. Could do with some more variety, there doesn’t appear to be enough characters to summon for this type of game. User interface is good, and the overall experience is very nice. Music: 6/10 – Music is good, but man, it gets old. There also are some characters that are voiced (in English even), and other characters are not. There’s an anouncer and other vocal cues too. Just wish there was more variety in background music, like different tracks that it would randomize through, or higher level tournaments having different tracks, etc. Storyline: 2/10 – When you first start the game, you’re presented a story, but it doesn’t really take root within the game. Well this is not a story based game. Monopoly does not need a story to be “fun” right? Still would like to see them implement some more story elements, such as unlocking more story scenes as you level up which you can choose to watch at your leisure. Characters 4/10: There seems to only be a handful of characters, maybe 6-7 “4 star” or lower characters, and a few “5 star” “exclusives”. I think they need more characters and more variety overall; but each character has destinct advantages and disadvantages in bonuses and enhancements given to gameplay. The artwork is also in the style I like (anime). Community: 7/10 – Each game is live with other players. There is no chat function, and even if there was, a vast majority of players are from overseas and likely wouldn’t speak english. You can’t trade with other players, and there’s no user marketplace. But the fact that each game pits you against 2 other real live humans in real time is very exciting. DRAGON+ Issue 5 – TYRANTS of the UNDERDARK Boardgame and more!